My commitment to these monthly updates continues and although I’m late in getting this Berlin expat life update post out, here I am. Last month, I dished about my night at Vabali Spa, a weekend in Budapest, and the experience of getting surgery in Germany. Recommended reading: My last update, Berlin Life Updates: January 2019 Was About Physical & Mental Health. February was significantly less fun though, as it was a really tough month that was hard to even write about. As the title of this blog post suggests, it was a month I’d rather forget. Read on to find out the most recent happenings with my Berlin life. My ongoing battle with the evil cigarette – I managed to go an entire month without smoking(! ), but then got boozed up one night with colleagues, and I smoked again. While I only smoked that one night, obviously my judgement withers after I’ve taken in some alcohol. One of these days, it would be cool to say that I haven’t smoked in years. Izzy’s is getting old – In sad news, I took my cat to the vet to get a regular checkup and grooming. Turns out she’s lost a lot of weight over the past year and may have thyroid problems. We’re now trying her out on some super healthy and all natural food with the hopes it will get her back to her old self. The results have been mixed, but she’s hanging in there. She’s getting old at 14 and I know I have to be realistic about her future, but I love my furry little beast rather fiercely and would like to keep her around a bit longer. I’ve been depressed – not in easy thing to write about, but with the stress of my health, the cat being sick, and a couple of other personal things I can’t mention, I cried more during this month than I had in ages. I felt a lot of social anxiety and didn’t go out much, even turning down invites and not going to events for which I’d bought tickets. I hope to turn this around in the coming months, especially as we “spring into spring”. Saving and not saving – once again, I managed to not put any money into my German savings, but did put it into my Canadian savings. I also failed to significantly reduce some debt I have in Canada as planned. Antisocial me – as mentioned, this wasn’t the best month for my social calendar and I stuck pretty close to home. I did do a some things though, like enjoy a fancy solo meal (and fantastic people watching) at the Michelberger Restaurant, meet a friend one night for pizza and beer at Brewdog, attend a leadership meetup, and indulgd in some retail therapy at the Mall of Berlin (I’m in love with Zara Home). This frequent traveller stayed put – I didn’t leave Berlin this month, as I was content to focus on my recovery and well being. I ended up rescheduling a planned trip to Kiev (I’ll go in June instead) and booked a trip to Stockholm for training. As there’s a new public holiday planned that week for International Women’s Day, I’ll turn it into a holiday as well and spend some time exploring the city. Only one blog post went out, but it’s a good one – I finally published a blog post that I’d been wanting to publish for a long time – I wrote about these 15 exciting day trips from Berlin. I’m heading to Stockholm for some Agile Leadership training. Sweden will be country number 39 for me and I can’t wait to explore my first Scandinavian country. Other March plans include watching the Berlin Ice Bears and seeing a comedy show. That’s it for my “Berlin Life Updates February 2019” post. The March update’s coming soon, but in the meantime, sign-up for my newsletter or peruse my Berlin diaries. 1) If you’re looking to explore Berlin, book a city tour. 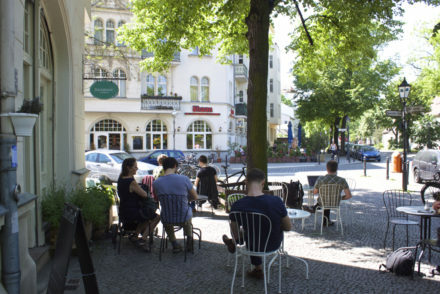 2) Book a hotel when you’re on vacation in Berlin. 3) If you’re a road trip junkie, think about renting a car. Berlin Love Notes – Snapshot I.